I recieved a request from Alley Cat Allies who’s mission is to end the killing of cats and lead the movement for their humane care. The following is a message I recieved this morning which all of our cat lovers should read and appreciate. It’s a story I hear every day: nervous caregivers get in touch with Alley Cat Allies to tell us about neighbors who don’t like the local cats and seem likely to call animal control to have the cats taken to the shelter. Most of the time, these neighbors aren’t aware that the cats are being cared for and fed. And they don’t know why calling animal control is such a bad idea. But you and I know that, more often than not, no good can come from a phone call to animal control. Virtually 100% of feral cats who enter the animal shelter system are killed. The fact of the matter is that these situations are common. And there are simple ways to address them using Alley Cat Allies’ community relations tools. 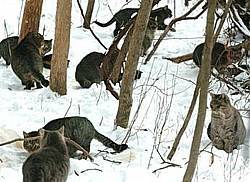 It starts with education: teaching neighbors about the special characteristics of feral cats and why Trap-Neuter-Return is the best way to care for them. Often, by listening to neighbor’s concerns to uncover the root of the problem, simple solutions can be found that help people and cats live together. One woman recently shared her story with me. Using Alley Cat Allies’ How to Live With Cats in Your Neighborhood brochure, Karen convinced her neighbor that the cats were better off living in their shared alley—and she helped him install deterrents to keep the cats out of his flower beds. He was thrilled and the cats were safe. Please find an affilite organization in your area and donate your help which is so need in these hard times. You may also want to visit our site to purchase an outdoor cat house to help your ferral feline friends this comming winter.